Martha Berry writes to Henry Sloane to offer her personal thanks for the certificates of stock in Congo-leum-Nairn, Incorporated. She expresses her hope that it will swell the Schools' endowment fund and interest. 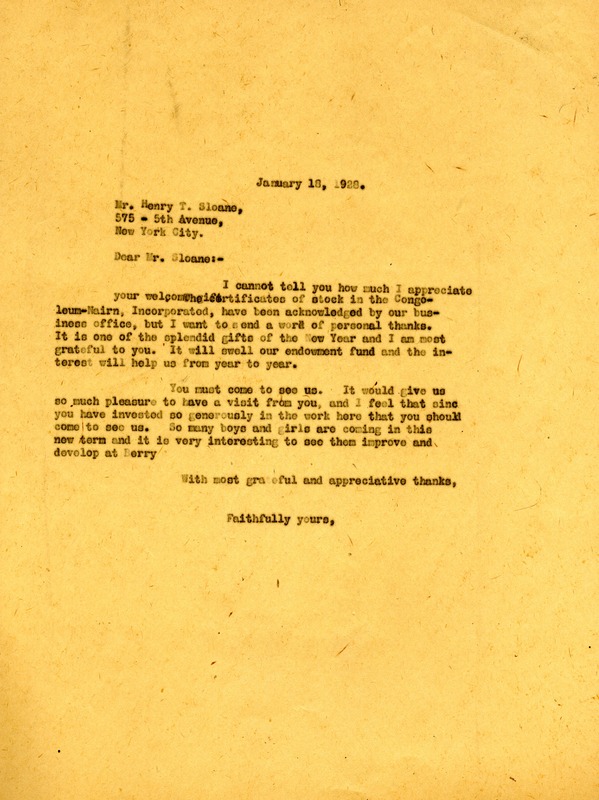 Her letter ends with her insistence that Mr. Sloane come to visit, particularly because of his generous investment in the work of the Berry Schools. Martha Berry, “Letter to Henry T. Sloane from Martha Berry.” Martha Berry Digital Archive. Eds. Schlitz, Stephanie A., Chelsea Risley, Lindsey Purvis, et al. Mount Berry: Berry College, 2012. accessed April 20, 2019, https://mbda.berry.edu/items/show/8949.